A lot of people love Chinese food, particularly one served at panda Express. However some of the Chinese food makes them add more weight. That is why we have accumulated the names of the items from their menu along with the calories. This helps check Chinese delicacy important for you. For instance, if you love Beijing Beef but when you spot the calories, you will want something much healthier such as the Broccoli Beef. At the end, you will find the names of the healthy choices and also why they are considered as that. Kids Dishes at Panda Express and their Nutrional Content. What are some of the Healthy Choices at Panda Express? The healthy choices are from the chicken section is Grilled Teriyaki Chicken, Mushroom Chicken and String Bean Chicken Breast. In the String Bean, most of the calories come from protein which means it is an excellent option for lunch or dinner. Grilled Teriyaki Chicken also has almost 50% of it to be protein. If your favorite meat is beef, you will have several choices but go with the Broccoli Beef. There were lots of memes and data on the internet going on saying how broccoli and has more protein than beef. While that might not be true or it is misleading, you can be sure that it is a healthy dish. The Beijing Beef has so much calories that cutting them off would be hard. If you search lists of healthy Chinese dishes or ask experts about it, they would recommend the Broccoli Beef. Going for Shrimp at Panda Express? There are choices for shrimp, but I would not recommend any unless you love shrimps because for many reasons. They do not fall into the healthy category is a prime cause. They come with a lot of cholesterol which is not good for the heart. People have this wrong idea that if they have shrimp, they are going to get protein. It is not true because the shrimp dishes here have very less protein compare to fat. The amount of carbohydrates and fat is more compared to protein. Crispy Shrimp has 46% fat and 40% carbs, Golden Treasure Shrimp has 44% fat and 40% carbohydrates and Honey Walnut Shrimp has 370 calories where fat makes more than 50%. Steamed White Rice has 0% fat, so you can go for that and 92% of it is carbohydrates. Steamed Brown Rice has a lot more calories than the first one as you have seen above and 83% is carbohydrates. Chow Mein and Fried Rice has so much calories it will fill your tummy. Though they taste better than white rice or brown rice so people end up buying the Chow Mein or Fried Rice. 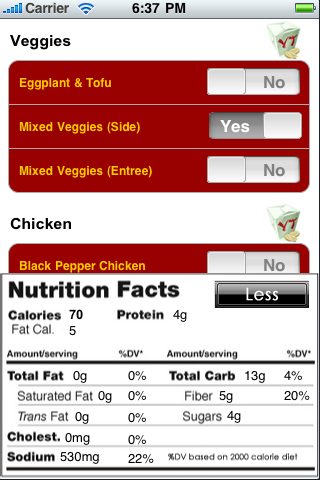 Another zero-fat dish would be the entrée mixed veggies. It is incredible because you get protein and carbohydrates without any fat. If you are a vegetarian, you can have this. There is nothing wrong going with the Hot and Sour Soup that has only 100 calories and a nice amount of protein. It also helps if you are dealing with fever or cold. There is no direct link but hot and sour soup can stop the root of inflammation which is linked to cold. That means, you do not have to take medications on the first day.